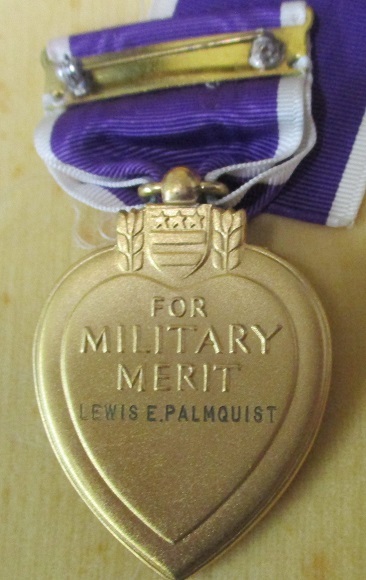 Lewis gave his life for our freedom while serving with the 680th Parachute Field Artillery, 17th Airborne Division. 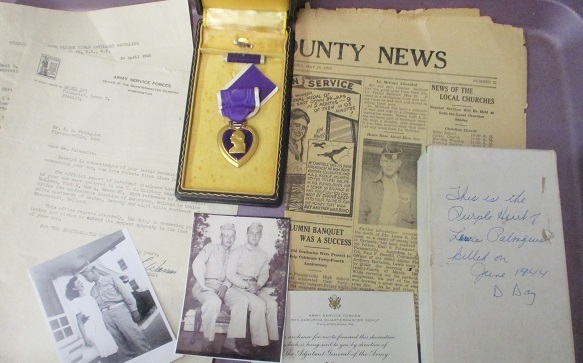 This group includes his officially named, cased complete Purple Heart award in it's cardboard outter box (incorrectly inscribed by the family), original Purple Heart award and condolence letter detailing events around his loss, home town newspaper with story on his loss, and two copy photo's. On December 16, 1944, the Germans launched a surprise offensive through the Ardennes Forest catching the Allies by surprise. The Germans were halted near St. Vith by the 82nd Airborne and Bastogne by a roadblock defended by the 7th Armored Division and the 101st Airborne Division. To help reinforce the siege at Bastogne the entire 17th Airborne Division was committed to combat, 23 -25 December, with elements of the Division flown to the Reims area in France and trucked into Belgium. The 17th Airborne Division, attached to Patton's 3rd Army was ordered to close in at Mourmelon. The 680th GFAB would fire in support of the 193rd GIR in the defense of the Meuse River sector from Givet to Verdun until 1 January 1945. On 2 January 1945 the 17th Airborne moved to Neufchateau, Belgium and on 3 January took up combat positions near Sibret, Belgium and fired their first combat rounds the next day. On 7 January, the 680th GFAB would gain their baptism of fire that would have tested the mettle of the most experienced airborne units. General Patton had ordered the 17th Airborne to seize the town of Flamierge where the 11th Armor and the 87th Infantry Divisions had encountered brutal resistance from the Germans. By the end of that first week of combat the battalion had fired 5560 rounds of ammunitions. The casualty count was two killed in action and five wounded. During the next month, the 680th GFAB moved several times within Belgium in support of the 513th . The sector selected for the assault was in the vicinity of Wesel, just north of the Ruhr, on 24 March 1945. Operation Varsity would be the last full-scale airborne drop of World War II and the assignment went to the British 6th Airborne Division and the 17th Airborne Division. This would be the last full-scale airborne operation of the war and the first combat glider landing for the 680th GFAB. The 680th's mission was to land north of Wesel in Landing Zone (LZ) S, a large flat area where the Issel River and the Issel Canal merge. Then to seize the crossing over the Issel and protect the division's right flank. As General Eisenhower watched the operation from a church tower on the west side of the Rhine the 680th had the misfortune of flying over a concentration of German antiaircraft weapons. Two-thirds of the C-47's were either damaged or in flames. The pilots remained with the aircrafts until they released the gliders which landed amid German Artillery units. The German gun crews immediately repositioned their guns for direct fire. The glider troops however prevailed and were able to overrun the German positions. By mid-afternoon on 24 March 1945 after sustaining high casualties, the 680th had secured its objective including the capture of 150 German prisoners, a battery of German 105-mm and a battery of 155-mm artillery.. By 26 March FM Montgomery had sufficient forces on the German side of the river to move eastward. The next day the 680th advanced toward the town of Haltern in support of the 513th PIR. On 2 April the battalion moved to a position south of Munster, where on the following day the 680th stopped an enemy counterattack by shellfire. The battalion remained on the move until 18 April when they arrived in the vicinity of Heiden, Gross Reckon, and Velden to take over the military government duties of that area in conjunction with the 513th PIR.